Original Content: How Long Can You Work On Something? Years ago, I met a guy in a hiking group whose wife had just had a baby. When he heard I wrote children's books, he said his wife was considering writing some children's books while she was home childrearing, to generate some extra income. I didn't know how to respond to that. 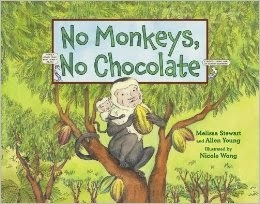 If only I'd had Melissa Stewart's timeline to publication for her picture book No Monkeys, No Chocolate. Ten years, folks. Ten years. You can be home with a lot of kids in that time. Keep in mind that Melissa has written and published many books. Many, many. And many of them were written and published during the ten year period she was working on No Monkeys, No Chocolate. Projects must be juggled. Sometimes for a long time.